I’ve cut down on carbs recently, which means I’ve been cutting down on bread. All I can say is, thank goodness for Pei Wei’s Sriracha pineapple pork lettuce wraps. I’m starting this year off on the right food, not only exercising more, but eating healthy. It’s not always easy for someone who likes to eat out, like me, but I believe you can find something healthy or at least healthier at just about every restaurant. Pei Wei’s is a great example and a restaurant I frequent often. I love lettuce wraps, not only because they’re little to no carbs in the amount of lettuce in a wrap, but lettuce wraps give me the satisfaction of eating a sandwich. And the Sriracha pineapple pork lettuce wraps from Pei Wei are to die for! I find them savory, with just the right amount of spicy married with sweetness. Yum! The Sriracha pineapple pork lettuce wraps feature, wok-seared pork and a combination of fresh cut ingredients — pineapple, red onions, and red and green peppers, topped with a kick of Pei Wei’s own Sriracha sauce and served with cool, crisp lettuce cups, making it the perfect light lunch. Or, add a Pei Wei’s Thai Wonton soup, a vegetable spring roll or edamame, with the Sriracha pineapple pork lettuce wraps to make a great meal for dinner. 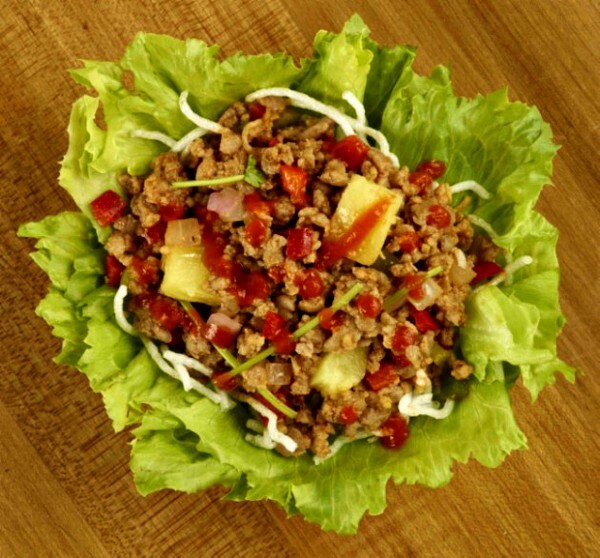 The Sriracha pineapple lettuce wraps are just $6.95. I especially like the spring rolls. Pei Wei’s three additional popular lettuce wraps are – Traditional Chicken, Thai Chicken and Korean Steak. I plan on trying the Thai chicken lettuce wraps soon. I highly suggest the next time you’re out, stop by Pei Wei and try the Sriracha Pineapple Pork Lettuce Wraps for yourself. I think you’ll be glad you did. I don’t do pork, but my husband would LOVE this! Oh gosh, those looks so delicious. How can I be starving for lunch when I already ate breakfast?!? Yummy right?! I love the idea of lettuce wraps! These look beyond delicious! I have never tried Pei Wei but it seems like that needs to change, and fast! That looks so yummy. The added pineapple looks like a really great twist on it. I cannot wait to try it. This looks so yummy. I can’t wait to try it. I have not been to pei wei in years. This makes me want to go back!! That all looks so delicious and extremely healthy. not sure there is pei wei in my area but those look so yummy! You had me a Sriracha, but pork and pineapple? Good thing they just opened a Pei Wei down the street. Those sound really good! I bet my husband would love to have them for work. I’ve only been to Pei Wei once, and it was fantastic. I’ll have to try this when I go again. Yum! That looks delicious, I wish we had one of these in our town. Mmmm, this looks really tasty and delicious! I’ve never tried something like this before, but it sounds so good! I wonder if I can make this? I’ve been wanting to try different foods so I’ll be checking them out. 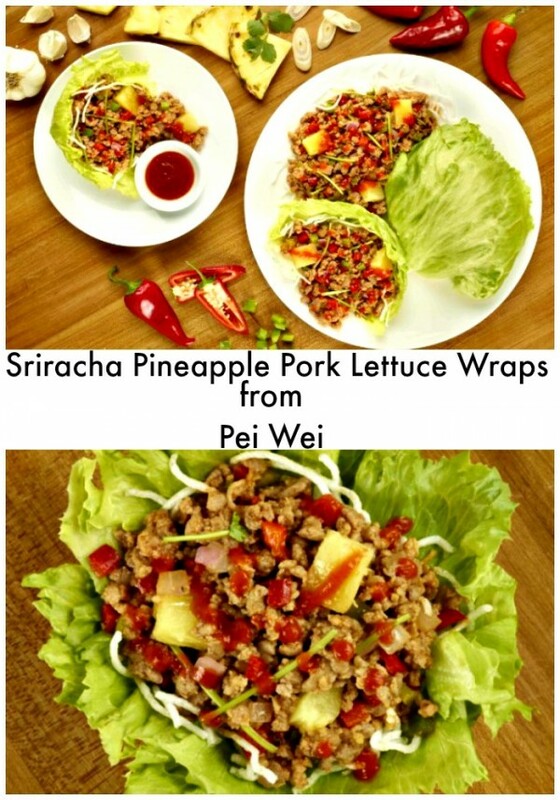 I’d love to try the Sriracha Pineapple Pork Lettuce Wraps. I would never have thought to use pineapple in a wrap like this, but these sound amazing! And I have to make a lunch date there now with a friend – those look so good! I have never had Pei Wei but I know for sure I am missing out! Yum these sound delicious! I am a Sriracha addict, this is a great recipe to try!